Gwendolyn Ann Strahl, 85, of Zanesville died at 8:00 P.M. Tuesday, September 18, 2018 at the Genesis Hospital. She was born on Friday, May 19, 1933 in Chillicothe, Ohio the daughter of Harold N. and Dora Hale Graves. 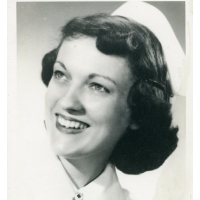 She graduated from Grant Hospital School of Nursing in 1954 and was a registered nurse. Gwen was a Presbyterian by faith. She was a member of the Lady Elks, American Legion Auxiliary, Eastern Star and Daughter of the American Revolution. She was a loving wife and mother. She is survived by her husband Charles “Chuck” Strahl, whom she married December 19, 1954; three children Mark Strahl, Lisa (Keith) Felumlee and Jane (Jeff) Berns; four grandchildren and two great grandchildren. There will be no services at this time. She has been cremated and her life will be celebrated by her family at a later date. The Bryan & Hardwick Funeral Home, 2318 Maple Ave. Zanesville is in charge of the arrangements. To share memories and condolences with Gwen’s family please click on the Tribute Wall tab on this page.